This month, I was given the opportunity to try my very first box of Honey Bunches of Oats courtesy of Purex Insiders. They sent me a full sized box of cereal, and a handful of FREE coupons to share with all of you. Did you know that nutritionist recommend eating 3 or more servings of whole grain foods per day (at least 48g/day)? And last but not least...its Heart Healthy too! With 0g Trans Fat, 0g Saturated Fat and 0mg Cholesterol. Who knew you could actually enjoy eating healthy foods?! I have to say that I absolutely love this cereal - as does my husband and girls. We couldn't get enough of this scrumptious cereal, and love the perfect bit of sweetness in each bite. I would highly recommend to try this cereal if you haven't before, or to try it again if its been awhile. I am definitely stocking up for this summer and can't wait to eat it for breakfast, snacks and maybe some other meals too! 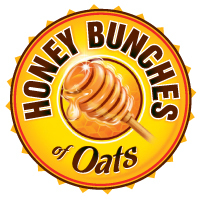 To learn more about Honey Bunches of Oats, visit their website and be sure to like them on Facebook. They actually have more than 10 different kinds to choose from. I received a free sample of Honey Bunches of Oats - Honey Roasted for this post from Purex Insiders. My participation is voluntary and my opinions, as always, are my own. 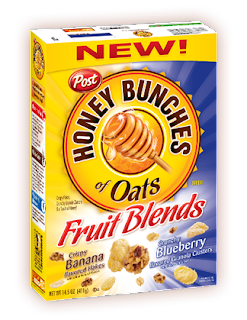 I would like to giveaway THREE Honey Bunches of Oats coupons - good for 1 box of 13oz or larger (up to $4.49, exp. 6/30/13) to THREE of my readers. To enter, simply fill out the Rafflecopter form below. This giveaway will end Wednesday, May 30th and the winners will be announced Thursday, May 31st! Good Luck!